This map was compiled by Bob Harper from the Northern Ireland Council for Voluntary Action (NICVA) in partnership with The Detail. It outlines the different types of cycle lanes and pathways provided in the Belfast area, and the location of the Belfast Bike docking stations. The boxes at the bottom left hand corner of the map provide a key for the different types of cycle lanes as well as the colour code for Belfast Bike activity. The map provides the option to click between different types of cycle lanes, including proposed cycle lanes hoped to be in operation within the next year. The map does not include bus lanes, though officials have said they are available to cyclists. The Detail has consulted with the Department of Regional Development and Belfast City Council on the creation of the map but it is possible that smaller lanes may not be represented. GOVERNMENT officials have accepted that more needs to be done to improve routes for cyclists in Belfast city centre, as The Detail publishes a map exposing gaps in the city’s cycling network. The map shows how cycle lanes are often at a distance from docking stations for the new Belfast Bikes scheme which was created to encourage members of the public to cycle. We also highlight concerns that the Belfast Bikes project, developed by the Department for Regional Development and Belfast City Council, is struggling to meet fund raising and journey targets for its first year. However Belfast council has defended the performance of what has proven to be a hugely popular bike scheme which has had over 5,000 subscriptions during the last six months. In a statement the council said: “Having reached its 100,000th journey within five months, the scheme has outperformed other cities such as Glasgow, which took 14 months to reach the same milestone. "The opening of the new docking stations at Titanic Belfast and Queen's University and planned extension of the scheme to hospitals in the spring will further increase the uptake of the bike share scheme in the new year. " Meanwhile a spokesperson for the Department of Regional Development (DRD) said: "Over the past number of years some good cycling infrastructure has been provided but we accept that better cycling infrastructure is needed generally." However the department said it did not believe this had undermined the success of Belfast Bikes and that a consultation was already underway for a new west-east link through Belfast city centre. However cycling campaigners have raised concerns about the safety of bus lanes for cyclists. Today we publish the findings of our research and release footage compiled by a cycling campaigner who filmed the dangers faced by cyclists struggling with traffic on Belfast’s roads. The map published by The Detail today and compiled by the Northern Ireland Council for Voluntary Action (NICVA) is the first time Belfast's cycling infrastructure has been available to view in an interactive format and allows for a comprehensive analysis of the system's strengths as well as weaknesses. Its findings come as Belfast Bikes marks six months in operation with those behind the scheme claiming it has “exceeded all expectations” with more than 100,000 journeys since launching in March. Jonathan Hobbs writes the Northern Ireland Greenways cycling blog. He believes the targets may be over ambitious. He said: “A harsh winter period may slow down new member sign ups, income and trips so it will be challenging to reach all the targets by the end of the first year. Belfast City Council said the opening of the new docking stations at Titanic Belfast and Queen's University as well as planned extension of the scheme to hospitals in the spring would further increase the uptake of the bike share scheme in the new year. There are currently 33 docking stations with 300 bikes throughout Belfast. 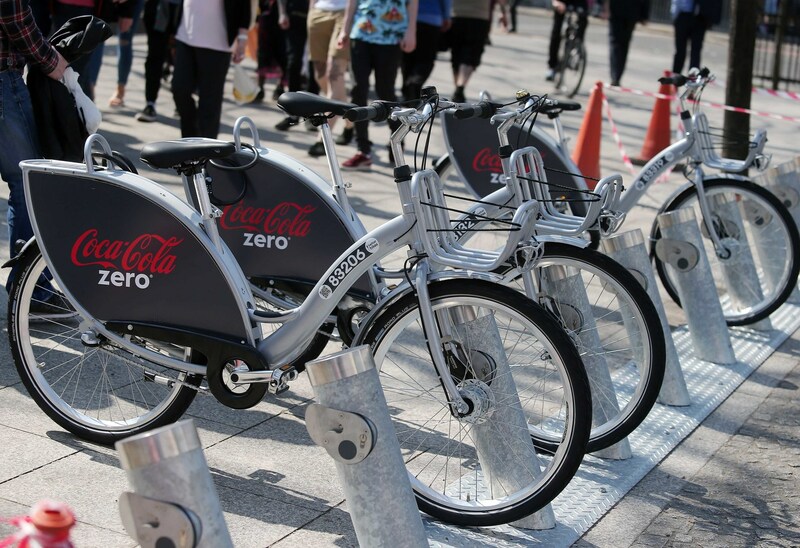 Those signing up to the CocaCola Zero Belfast Bike scheme can either pay £20 for an annual subscription or £5 for three day casual use, while the first 30 minutes of each trip is free of charge. DRD invested a capital grant of £1.1 million into the scheme and the council said that current running costs amount to approximately £35,000 a month. Commenting on its targets for income generated by the scheme, a spokesperson for the council said: “A primary objective is to provide a bike share scheme which is affordable and therefore the council has set the level of subscription charges at a low rate to encourage accessibility and usage." Cycling and walking charity Sustrans produced a Belfast Bike Life survey with DRD earlier this year. It stated that there are 82 miles of cycle lanes in Belfast, but these are made up of a mixture of on-road and off-road lanes as well as segregated and shared lanes. Click here to view the interactive map in full screen to explore where and what type of cycle lanes are currently operational in Belfast. The map also provides the option to view proposed routes that will stretch from the Westlink at Grosvenor Road through to Castle Junction and from Castle Junction to Titanic Quarter Station, linking to the Comber Greenway. DRD said it hoped these lanes would be a starting point in addressing any concerns about volumes and speeds of traffic that still remain an issue in Belfast City Centre. A spokesperson said: “Information days took place earlier this year and consultation is currently ongoing on a number of schemes which will create a west-east link through the Belfast city centre. These will join good off road provision which currently exists just at the edge of the city centre core. Commenting on the map the department said that although there may appear to be gaps in the city centre’s cycling infrastructure it believed there were "a number of streets such as quiet local links where traffic volumes are low and speeds are slower where cycling infrastructure is not needed." Cyclist campaigner Jonathan Hobbs cycles every day. The Detail has edited together a short video of some of his journeys across Belfast captured by a camera mounted on his bike. Jonathan says bus lanes should not be used to move large numbers of bicycles around. He said: “Bus lanes are simply not bicycle infrastructure. They're a bit like stabilisers - handy as a way to support a city learning how cycling as transport works, but irrelevant once Belfast becomes more confident about providing dedicated bicycle routes. In a statement DRD said: “The Department does not claim that bus lanes are all that cyclists need but simply that they are beneficial to people who wish to cycle. Click here to read Detail Data's previous work on mapping the most dangerous areas for cyclists in Northern Ireland.